St Johnstone have confirmed former Northern Ireland midfielder Steve Lomas as their new manager on a two-and-a-half-year contract. The 37-year-old has been appointed as successor to Derek McInnes, who last month left the Scottish Premier League club for Bristol City. And it coincides with chairman Geoff Brown's surprise decision to step down and hand control to his son, Steve. 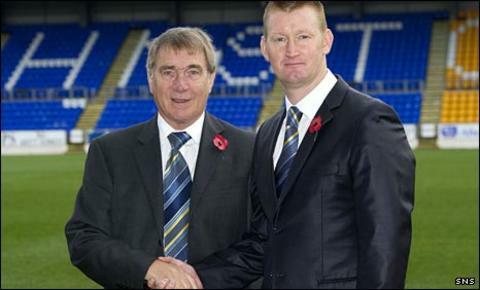 Lomas said: "I'm delighted but have emotions with Geoff stepping down." Appointing the former Manchester City, West Ham and Queens Park Rangers player was the last act of housebuilding businessman Brown's 25-year reign, which made him the longest-serving chairman in the Scottish Premier League. "I thought it was something I said in negotiations," joked Lomas as he was unveiled at a media conference. Lomas previously managed Southern League side St Neots Town, while his most recent job was in charge of the reserves at West Ham. He revealed that he had spoken to predecessor Derek McInnes, who left for Bristol City, and previous boss Owen Coyle before accepting the offer. "They said they are very loyal to the managers, which is something, as a player of eight and a half years with Man City and West Ham, that is part of my ethos," he said. Lomas, who will be assisted by Tommy Wright after his former international team-mate , impressed Saints' outgoing chairman with his leadership qualities. "It's the right time," said the new boss. "Even when I was playing, I wanted to be a manager. "The way I played, I was captain at most of my clubs. "I never sat about waiting for it to happen. I have done my licences and courses and got experience at non-league level. "I coached the youths at Norwich and the reserves at West Ham. "I had a couple of offers before this, but I feel this is the right club." Lomas, who won 46 caps as a tough-tackling midfielder for his country, was interviewed after Saints failed to agree terms with Sligo Rovers boss Paul Cook. St Johnstone sit fourth in the SPL and have lost one and drawn one since McInnes left, with McDiarmid Park coach Alec Cleland looking after the first team along with midfielder Jody Morris. Cleland had expressed his desire to stay in the post full-time, while former Aberdeen manager Mark McGhee also declared his interest. However, it is Lomas who will take charge of his first match when Aberdeen visit McDiarmid Park in the SPL on Monday night.